For most high school basketball teams, the day after a big Friday night victory is spent with rest and maybe some film-watching in preparation for the next game. But the McNary boys basketball program does things a little bit differently. After defeating David Douglas 65-55 in the Newberg Boys Basketball Tournament on Dec. 21, the McNary boys spent the following day buying and wrapping Christmas presents for a family in Keizer. During each holiday season, as a part of the senior leadership project, the Celtics will find a local family in the community with young kids that are in need — the family is usually selected through churches or schools. The McNary basketball program has been doing this for nearly a decade. The team bought the gifts with money that they fundraised through helping out at youth basketball tournaments that are hosted at the high school and getting sponsors through their annual free-throw-a-thon. Kirch reached out to the family the week prior to make sure everything was situated, but it’s up to the players to figure out how to break up the fundraising money and how to handle shopping and gift-wrapping duties. McNary senior Noah Hudkins echoed those same sentiments. “It’s amazing to have this opportunity to provide a Christmas for someone else,” Hudkins said. This year, the lucky recipients were Ashley Beltran’s three daughters — Jasmine (age 6), Jade (age 7) and Lily (age 8). Beltran, whose kids attend Keizer Elementary, filled out a form from the school asking for help for the holidays. Due to an unforeseen emergency, Beltran felt that she would have a hard time providing presents for her children this Christmas. But her fears were alleviated when Kirch informed her that his team was going to step up for her and her kids. After buying a myriad of gifts on the morning of Dec. 22, the Celtics squad made their deliveries to the Beltran girls later that afternoon. Jasmine, Jade and Lilly received multiple presents, such as, winter coats, LOL Dolls and Pikmi Pops — which are large lollipops stuffed with other toys inside. The three girls were ecstatic about receiving the surprise presents from the players, and they were even more excited when they got to open the numerous packages on Christmas Day. After losing their first two games at home by double-figures, the McNary High School girls basketball team finally found their stride on the road. Leah Doutt and Abigail Hawley led the Lady Celts with 11 points apiece as McNary notched their first win of the season at Madison on Tuesday, Dec. 11, beating the Senators 43-38. Doutt and Hawley each knocked down a 3-pointer in the final minute of the opening quarter to give McNary the early 18-10 advantage. The Celtics went through a cold streak in the second period, shooting just 2-of-17 from the field. However, McNary’s ability to limit Madison on the glass helped them retain the lead at 23-18 going into the break. Rebounding had been a huge issue for the Celtics to begin the season, but McNary won the battle on the boards 34-31 and created numerous second-chance opportunities by grabbing 14 offensive rebounds. Even though they only clung to a 31-29 advantage to end the third quarter, the Celtics started to pull away in the final period after going on a 10-3 run. Madison made it a one possession game late in the contest, but Doutt put the game on ice by sinking a pair of free throws with 4.3 seconds remaining. Doutt, who missed the previous game due to illness, made a big difference for the Celtics in her return to the lineup as the starting point guard. The Celtics turned the ball over 25 times in their loss against Westview in Doutt’s absence. However, McNary only gave the ball away six times versus Madison. “When your point guard is back, you’re just able to handle (defensive) pressure better,” Doran said. McNary fell to Central Catholic last Friday by a score of 64-48, dropping their record to 1-3 on the season. The Lady Celts will travel to Southern Oregon tonight to take on North Medford at 7 p.m. and then play against South Medford at 1:30 p.m. on Saturday. Boston Smith led the Celtics with 25 points on 9-of-15 shooting as the McNary boys basketball squad moved to 4-0 on the season with their 74-61 victory over Mountainside on Tuesday night in their first home game. “We’re still getting used to playing with one another a little bit, but I thought that we made some important plays at important moments,” McNary head coach Ryan Kirch said. Nate Meithof was also in double-figures with 15 points — 11 of which came in the first quarter. Griffin Oliveira had 13 points and knocked down a pair of shots beyond the arc while Alfredo Villareal added 12 points. Both squads played at a break-neck pace to begin the game as it seemed like the ball barely touched the floor in the opening quarter. Meithof was incredibly aggressive early on, which worked to the Celtics advantage. The sophomore guard scored nine points on 4-of-5 shooting in the first three minutes of the game, including an impressive three-point play where he split a double-team on his way to a nice finish off the glass. Despite Meithof’s scoring flurry, Mountainside still held a 15-10 advantage midway through the first quarter. But a pair of buckets by Villareal and a layup from Smith helped McNary go on top 21-19 at the end of the period. After Mountainside came back to take the lead momentarily, McNary responded by going on an 11-2 run and forced Mountainside head coach Dustin Hewitt to burn a timeout with his team trailing 32-26. McNary was much more intentional about slowing the ball down in the second quarter with the goal of getting Smith more involved in the offense on the low block. 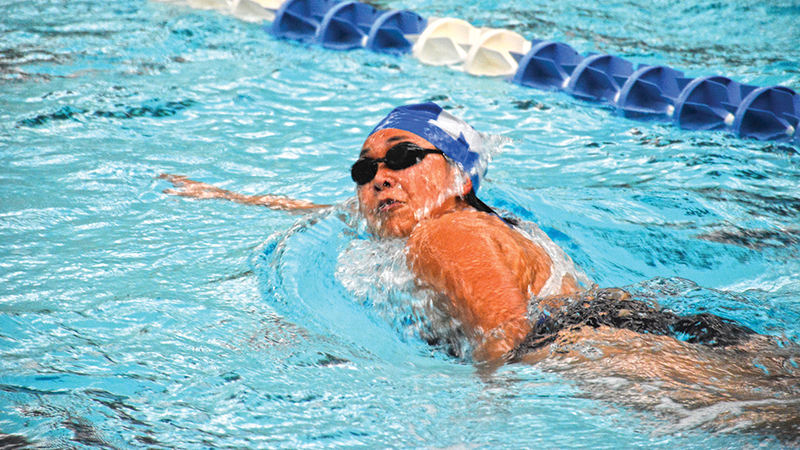 The plan was executed effectively as the senior center finished with eight points in the quarter. McNary was able to extend the lead to nine before the break at 45-36 thanks to a transition layup by Oliveira. After a first half full of explosive offense, McNary went stone cold to begin the third quarter. Smith finished one at the rim in the Celtics first possession of the period, but a five-minute scoring drought allowed Mountainside to cut the lead to 47-42 with less than three minutes remaining in the quarter. But a midrange jumper from Oliveira and a three-point play from Smith got the Celtics advantage back up to double-figures. The Celtics eventually took a 57-44 lead to the final period after Smith hit a nifty floater right before the buzzer sounded. A big key that allowed McNary to pull away in the second half was their intensity on the defensive end. The Celtics allowed just two points over a seven-minute stretch and did a much better job of closing out to shooters and not allowing second-chance opportunities. McNary led by as many as 20 after a baseline 3-pointer from Riley Flores made it 70-50 late in the fourth quarter. Mountainside rallied back to make the score a little more respectable, but Smith put an exclamation point on the game in the final moments with a monster two-handed jam that sent the student section into a frenzy. “It felt good to play at home. This was a good confidence booster for our team,” Boston said. McNary will compete in the Newberg Boys Basketball Tournament this weekend, with their first game coming Friday at 6 p.m. against David Douglas. With a relatively inexperienced roster, the McNary boys basketball squad needed someone to step up for them in their first game of the season. Boston Smith was the one who answered the call. 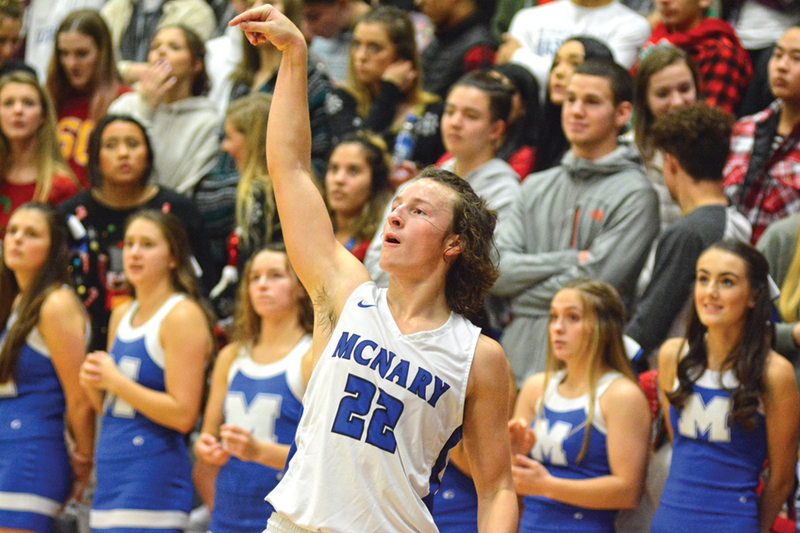 The 6-foot-7 inch senior post had a game-high 24 points and was a perfect 11-for-11 from the field as McNary took down Madison 71-61 in their season opener on Friday, Dec. 7. Nate Meithof was also double-figures with 15 points in his first varsity game. Madison was able to keep the game close in the first half in large part due to key Celtic players getting in foul trouble. Smith and senior wing Griffin Oliveira each picked up a pair of fouls in the opening quarter and had to sit for the remainder of the first half. But McNary was able to weather the storm and score 23 points in the second period to take a 36-34 lead into halftime. The Celtics still clung to a two-point lead as the game entered the fourth quarter. That is when Smith asserted his dominance. Smith completely took over the game in the paint and scored 14 of his 24 points in the final period, allowing McNary to pull away for the 10-point win. “We really struggled to get the ball inside to (Smith) early on due to a lot of unforced turnovers in transition. But we slowed the ball down quite a bit in the fourth quarter and got Boston the ball down low,” Kirch said. McNary returns to the hardwood on Saturday for an away contest against Hillsboro at 3 p.m. The Celtics play their home opener on Tuesday at 7 p.m. against Mountainside. McNary’s girls basketball squad was able to be competitive in the early stages, but turnovers and poor shooting kept them from staying close. The Lady Celts turned the ball over 22 times in the contest and shot under 20 percent (6-of-32) from the field in the second half in their 75-43 loss to Westview on Friday, Dec. 7 at McNary High School. Abigail Hawley was the only McNary player in double-figures with 12 points. After falling behind to start the contest, Hawley knocked down consecutive 3-pointers to tie the game at 6-6 early in the opening period. Mackenzie Proctor then got in on the action with a triple of her own, as well as a tough lay-up to give McNary the 14-11 lead. But late in the quarter, Westview put on a full-court press that the Celtics weren’t prepared for. McNary’s starting point guard Leah Doutt was forced to miss the game due to illness, and Westview took advantage by swarming the Celtics with intense defensive pressure in the backcourt. McNary turned the ball over on four straight possessions, which allowed the Wildcats to go on a 9-0 run and take a 20-14 lead. Without their best ball-handler, the Celtics greatly struggled to get into their half-court offense for the majority of the game. Transition buckets by Isabella Walker and Rebekah Grimmer gave McNary the momentum to begin the second period, but three straight triples from Westview’s Nicole Flennaugh put the Wildcats up by double-digits. Flennaugh torched the Celtics for a game-high 30 points. “(Flennaugh) is a really good player and we didn’t do a good enough job communicating on screens to be able to get a hand in her face,” Alfaro said. After going to the locker room trailing 41-27, Alfaro and Kennedy Buss each got easy hoops in the opening minute of the second half to cut the lead to 10. But a 20-7 run by Westview made it impossible for the Celtics catch up. McNary will travel to Central Catholic tonight for a 7 p.m. contest. The McNary High School wrestling team sent 11 athletes to the podium and finished in third place as a squad in the 24-team Springfield Invitational on Saturday, Dec 8. With their first conference meet right around their corner, head coach Jason Ebbs is impressed with how his young squad is progressing. Of all the Celtic wrestlers, Anthony Garcia-Reyes was the most impressive. The junior went 5-0 for the tournament and won all of his matches either by pin or major decision and was crowned the tournament champion in the 220-pound division. It was first time Garcia-Reyes had placed first at a tournament in his career. Grady Burrows (120 lbs.) and Garrett Wampler (182) each took third in their respective weight classes after ending the day with a record of 4-1. Eoan Sharabarin (113) Matthew Mehlhoff (160) and Ryan Bamford (182) finished in sixth place while Noah Gatchet (120) took seventh. After losing his first match, Gilbert Parra (145) came back to win his next two before falling in the consolation championship. McNary also got big contributions from a trio of freshmen. Jordan Orr (106) won three out of his four matches to take sixth place. Estaban Victoria (138) also placed sixth while Layne Runyan (220) took seventh. McNary will compete in the Liberty Invitational Tournament at Liberty High School in Hillsboro on Saturday starting at 9 a.m. Their first Mountain Valley Conference dual meet will take place at Sprague High School on Wednesday at 7 p.m.